It was lovely to be back at Houchins Farm again to set up the yummy wedding cake for Louise and Will. They chose to have a plain white iced wedding cake which I then sprayed with edible lustre to give it a bit of a shimmer and finished it off with royal iced pearl dots. 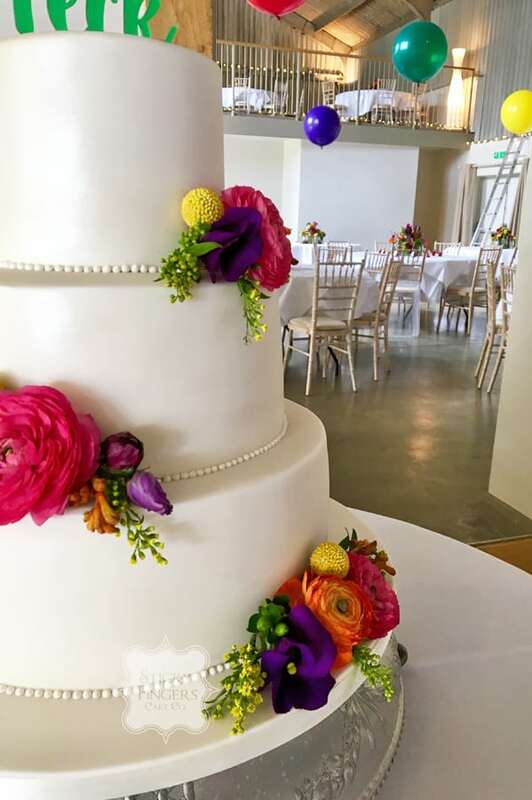 I decorated their simple 3 tier cake with fresh flowers which matched the flowers they had in Louise’s bouquet and table decorations – beautiful bright colours which really stood out against the white icing! The flavours they chose were Red Velvet, White Chocolate and Passion fruit and Traditional (but not too traditional) Fruitcake. Sending huge congratulations to the happy couple!